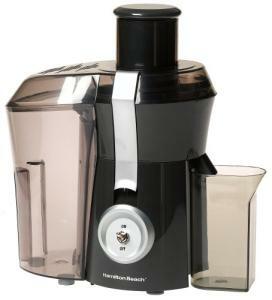 The Hamilton Beach Juice Extractor offers a powerful 1.1 horsepower motor and operates from a single main switch. With strong die cast metal clips to secure the chute, a stainless steel strainer, and an extra large feed chute, this juicer is well designed. A juice cup is included, along with a special cleaning brush. The Big Mouth Pro can juice whole fruits or large pieces of fruits and vegetables, so it works faster and more conveniently than other models. The pulp bin is dishwasher safe. This juicer is an overwhelming favorite of people who have used it. It cleans up easily, creates a ton of juice very quickly, and is quite efficient. It is very satisfying to put big chunks of food into the machine and watch the juice pour out. The Big Mouth Pro Juicer makes juicing more a convenience than a chore, which leads to even more juicing. Part of the fun is coming up with new flavor creations and since it's all healthy, you can indulge without guilt. If you clean the parts soon after juicing, the maintenance is even less of a hassle.